I'm clueless about decorating walls. I have two crutches - one is vintage printed tablecloths, which I'll post about later; the other is mirrors. I love a big, gaudy pier mirror, but I also like the airiness of frameless, beveled mirrors. You can find them at antique shows, yard sales, and Ikea, but the problem is the mounting hardware - it usually detracts from the mirror's simplicity. 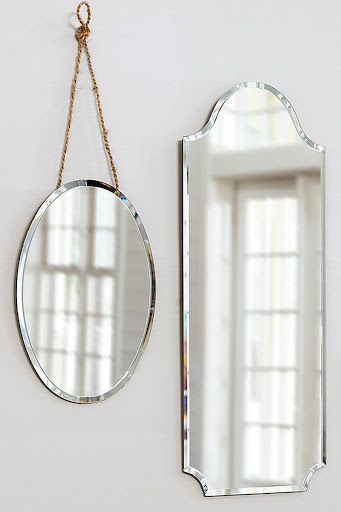 These mirrors from Pottery Barn come backed with a panel that has hooks attached, but I have a hard time paying $99 for what is essentially this mirror. So here's an easy solution! Trace the shape of your mirror onto your rigid paperboard. I used four-ply museum board, because that's what I had around the house - it also has a very fine, even texture that makes it more suitable than chipboard for this application. Next, draw a line about 3/8" inside the outline, and cut out the smaller oval with a heavy-duty Exacto or Olfa blade. Trace this shape onto another sheet of board, and cut out a second oval. Using a good amount of Elmer's, Sobo, or similar all-purpose glue, glue the two sheets together to make them double-thick. Now decide where you want your hooks to be, and mark the spots. Using a very fine nail or a metal tack and hammer, pound 16 small holes - 4 rows and 4 columns. The total width of the area should be the same width as your ribbon. Cut two 4" lengths of ribbon. Fold one in half, and string the D-ring onto the loop. Now, sew the loop into place using the holes you've just made. Aim for redundancy - use a good bit of thread, and use every single hole, going over the top row a couple of times. Once you have your mounting board complete, follow the instructions on the epoxy or mastic to adhere the board to the back of your mirror, and let it cure completely. Now you're ready to hang your mirror and ask, "Who's the craftiest of them all?" This is beautiful and a great idea! Thanks!